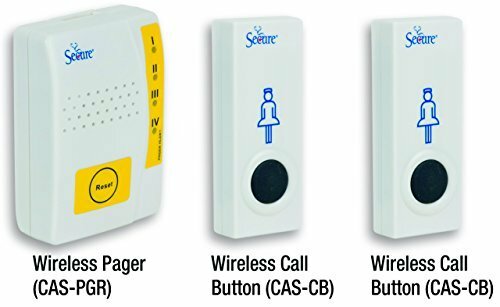 The Secure Wireless Caregiver Pager w/ two Nurse Call Alert Buttons is the perfect nurse call product solution for at-home caregivers - Wireless Caregiver Pager alerts caregiver via sound, light and vibration when a patient presses the call button to request help - Package includes one Wireless Caregiver Pager (reciever), two Wireless Call Buttons (transmitters), and batteries for all components;Up to four Wireless Call Buttons can be paired with one Wireless Caregiver Pager - Search ASIN: B00P88S6J6 to purchase additional Wireless Call Buttons or other available transmitter components to pair with the Wireless Caregiver Pager (motion sensor, bed sensor pad, bathroom pull cord alert, call button, door/window alarm) - Pager & monitoring components include batteries and mounting tape/hardware;Wireless Caregiver Pager features multiple sounds and vibration alert - Pager can be set to... 1.) Sound Only 2.) Sound+ Vibrate 3.) Vibrate Only - Pager features a belt/waist clip to attach to users belt for constant patient monitoring;Monitoring distance up to 500 ft. in an open area (walls and other interference may decrease operating distance);Backed by Personal Safety Corporation's one year warranty and exceptional customer service - Trust in a brand used in thousands of concerned care facilities throughout the US, Canada and Europe Since 1991!